First of all, I must apologise for the fact that I am now behind by a week in my 30 Week Writing Challenge. This is because Question 9 is a hefty one and I can&apos;t just bash the answer out in five minutes. I need to actually sit down and make the time to answer it properly. My intention therefore is to answer two questions for this week, so please stay tuned this Wednesday. 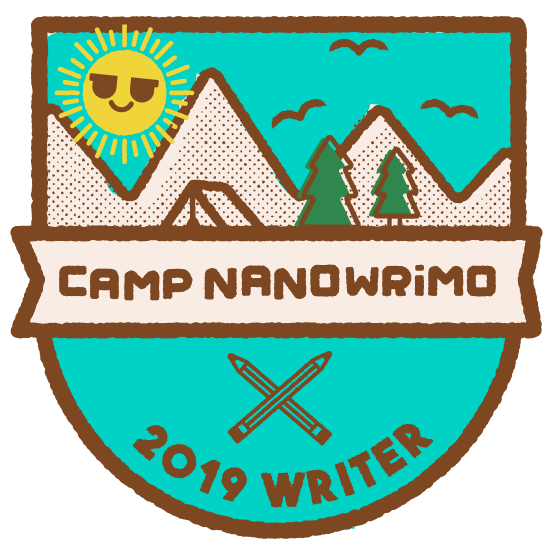 This July, I won my first ever Camp NaNoWriMo. I feel like I keep participating in these events and failing — which is rather disheartening — so this time I made sure to set myself a realistic goal that I could meet despite having a full-time job, a boyfriend, and a family to placate. The aim was to write for the equivalent of 1 hour for every day of the month of July. It worked! I smashed it, I had fun, and I&apos;m just that little bit closer to meeting my self-imposed 31st December 2017 deadline for completing a first draft of The Mayor. Hazzah! Something else cool, my writing partner K.F. Goodacre recently attended a medieval festival called the Loxwood Joust. First of all, can I just say how jealous I am. I love all things medieval (I read Medieval History at University) so it is my fervent hope that I am able to go with her next time. It looked like such amazing fun! Whilst she was there, she very kindly picked up some homemade gingernut biscuits for me, which were made according to a recipe from the 18th century. The true thoughtfulness of this gesture will be lost on you, Dear Reader, so I will endeavour to explain. Melora — the 18th century protagonist of The Mayor – adores gingernut biscuits. They are her absolute favourite, and I use them as a neat little device for helping her to form bonds with other characters (Redcoat Jack for example gives Melora gingernut biscuits to help her with seasickness when she first joins his ship). Kim knew this, so she bought them for me from this festival (not very medieval, I know, but still historical I guess!). They&apos;re so awesome, I&apos;m almost reluctant to eat them. Almost. As if that weren&apos;t enough, she also gifted me with a genuine pirate doubloon from a company she has forgotten the name of (I&apos;m trying to find out) who have helped provide productions like Game of Thrones and Pirates of the Caribbean with their props. Lookie! Thank you so much, Kimothy! ♥ I knew you were my writing partner for a reason. Thank you for continuing to inspire and motivate me to write this blasted thing. Lastly (slightly off-topic) Voltaire&apos;s new album Heart-Shaped Wound dropped on Friday. It. Is. Awesome. Voltaire, for those of you not in the know, is huge news on the Goth scene and his piratey album To The Bottom of the Sea features heavily on the playlist for The Mayor. Decidedly more melancholic and personal than the likes of say, &apos;Zombie Prostitute&apos; and &apos;Brains!&apos;, I strongly recommend Heart-Shaped Wound. Please check it out here – it&apos;s on sale and you won&apos;t regret it! It even features the likes of incredible metal vocalist Alissa White-Gluz (now there&apos;s a musical collaboration I definitely didn&apos;t see coming! It&apos;s so good to hear her singing cleans again).